The Bacon Day that I had involved the purchasing of 2.5 lbs of thick-cut bacon but did not involve the cooking of all said poundage. We ended up freezing what we didn't use in portioned bags that would allow for us to cook reasonable amounts when the time called for it. When one day we wanted to use up what was left of our supply and seeing as we had the ingredients for a BLT, it was time to make our own version! I got a lot of lettuce out and sliced up the equivalent of one tomato per sandwich. Multi-grain bread was toasted, and bacon was heated up. The vegetables all laid out and the mayonnaise jar on the table, I got to building up a delectable sandwich for Duc. I personally had just a regularly stacked BLT but I wanted to make sure his was ridonculous. 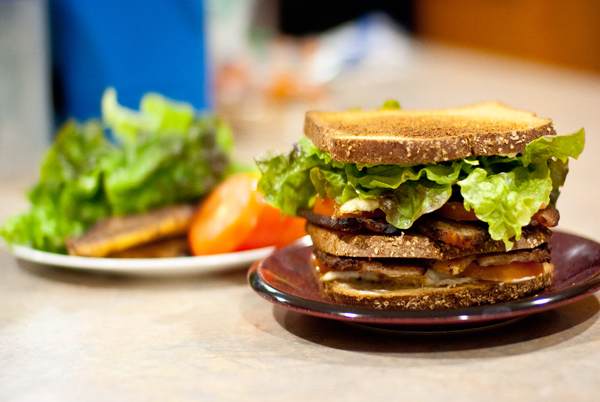 Three slices of toasted bread, 4 leaves of red leaf lettuce, 6 pieces of thick-cut bacon, 2 spreads of mayonnaise, 2 fried eggs (a twist on a BLT, I know...sorry), and 1 fully slice tomato later, he was sated and I was amazed that he could even bite the thing. Fun times!